Ubiquitin is a highly conserved and plays an essential role in the ubiquitin-proteasome pathway. Ubiquitin is a highly conserved and plays an essential role in the ubiquitin-proteasome pathway. In ubiquitination process, it is first activated by forming a thiol-ester complex with the activation component E1, which is then transferred to ubiquitin-carrier protein E2, followed by to ubiquitin ligase E3 for final delivery to epsilon-NH2 of the target protein lysine residue. 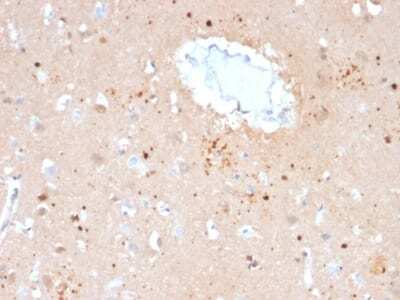 IkB, p53, cdc25A, Bcl-2 etc. are shown as targets of ubiquitin-proteasome process as part of regulation of cell cycle progression, differentiation, cell stress response, and apoptosis. Moreover, ubiquitin have been reported to bind covalently with pathological inclusions which are resistant to degradation e.g. 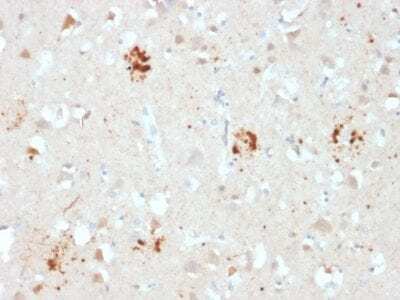 neurofibrillary tangles/paired helical filaments in Alzheimer’s disease, Lewy bodies seen in Parkinson’s disease, and Pick bodies found in Pick’s disease etc. 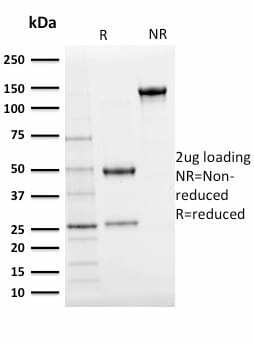 Catalog number key for antibody number 2122, Anti-Ubiquitin (UBB/2122) The prefix indicates conjugation, followed by the antibody number and size suffix. Hochstrasser, M. 1995. Ubiquitin, proteasomes and the regulation of intracellular protein degradation. Curr. Opin. Cell Biol. 7: 215-223.